This rectangular end table is a classy traditional addition to the living room in your home. Constructed of the finest Poplar hardwoods, with Cherry veneer overlays all completed in a rich Sable finish, this table is certainly built to stand the test of time. Slightly fluted and tapered square legs hold an upper table top with a quaint storage drawer embedded in the table apron. Perfect storage and display beside and chair or sofa in your home. Pair this popular end table option with the coordinating lift top cocktail table and sofa table to complete the look in your home. The Enclave HAM Rectangular End Table by Hammary at Furniture Barn in the Pennsville, Bear, Newark, Hockessin, Middletown, New Castle, Townsend, Talleyville, Wilmington, Marshallton, Smyrna, Elkton, area. Product availability may vary. Contact us for the most current availability on this product. Wood & Finish Radiant "Sable" finish. Handles & Hardware Burnished knob pull hardware. Case Detail Clean edges, fluted tapered legs, and light distressing. Case Construction Constructed of Poplar solids with gorgeous Cherry veneers. Find your place. Find your niche. Find your enclave, with the appealing new Enclave collection. This pioneering transitional table group has been crafted from elite poplar solids and cherry veneers. 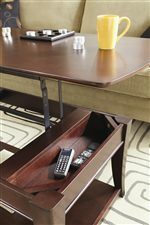 The table tops feature sleek, rounded edges, and each piece boasts ample shelving for storage and convenience. The rectangular cocktail table in this collection has been castered for easy mobility with a handy lift-top. Finally, the radiant sable finish makes this reasonably-priced collection look better than furniture that is many times more expensive. The Enclave collection, helping to make your home the sanctuary that you deserve. The Enclave HAM collection is a great option if you are looking for Transitional furniture in the Pennsville, Bear, Newark, Hockessin, Middletown, New Castle, Townsend, Talleyville, Wilmington, Marshallton, Smyrna, Elkton, area. Browse other items in the Enclave HAM collection from Furniture Barn in the Pennsville, Bear, Newark, Hockessin, Middletown, New Castle, Townsend, Talleyville, Wilmington, Marshallton, Smyrna, Elkton, area.